Lot Size: 5310 sq. ft. Interior Size: 2056 sq. ft.
An immaculate home in Rancho Carrillo's prestigious Palmilla community. 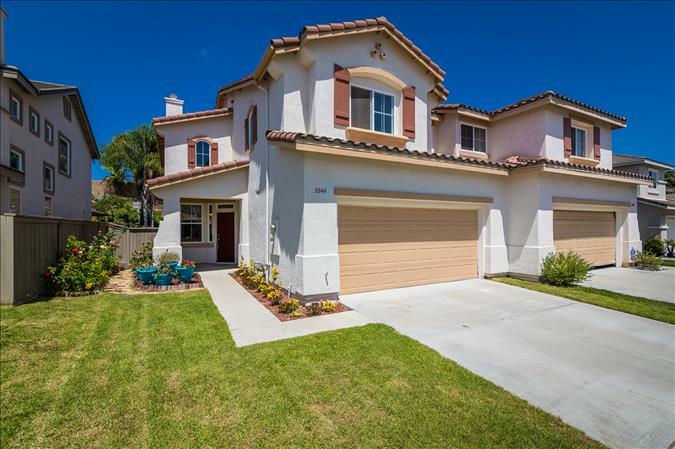 One of the largest two story attached single family residence in Carlsbad. Inviting, spacious open floor plan with refreshing coastal breezes. Natural light overflows in each room and grand vaulted ceilings. Beautiful remodeled kitchen w/granite counter tops, travertine back-splash, plenty of cabinet space, updated bronze hardware and stainless steel gas stove and dishwasher. Open kitchen family combo with a separate dining and living room featuring a ceramic gas fireplace. Incorporates recessed lighting, ceiling fans, forced air heat, dual panned windows, and AIR CONDITIONING through entire house. Master bedroom has a walk-in closet and combines a walk-in shower with a tub; for those days where you just need a relaxing bubble bath. The fourth bedroom is set up to be used as an office, with built in cabinet space. Separate room for your laundry to hold those piles of dirty clothes. Space under stairs to be used for storage or for a cool kids play area. Over-sized two car garage. Beautiful, private backyard with new sod, tropical potted plants all around, flagstone patio, PLUS, an umbrella to shade you from those hot Cali sun rays. Resort style community pool, spa and recreation center. This home has it all! Situated in a cul-de-sac and centrally located with convenience of travel to Palomar Airport, shopping, freeway and the 78!